In UseThisTip, we have already covered ways to send self-destructing notes and self-destruction email address. Now, we have another nice service that lets users post self-destructing tweets. Twitter is a popular microblogging website. It is the biggest source of breaking news. People share whats happening in just 140 characters. But after 2-3 hours, your tweet has no value. No one pays attention to an old tweet. So, posting self-destructing tweets also makes sense. 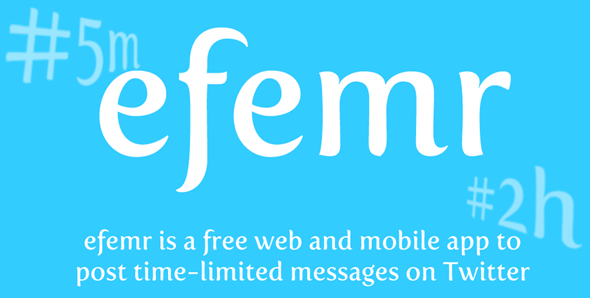 Efemr is a nice service that makes self-destructing tweets possible. This service works on the hashtags, so you need to know how to tweet self-destructing tweet with Efemr. Visit Efemr and sign in with your Twitter account. Authorize the app to access your tweet and you are on the dashboard. Now, you need to know how to send self-destructing tweets. Write the tweet and add a hashtag with expiry time limit. If you want your tweet to be deleted automatically after 5 minutes, use hash tag #5m. To mention time in hours, use h. So, if you want your tweet to be deleted after 1 hour, use hash tag #1h. Use hash tag according to your need. As company accepts the delay, my tweet was not deleted in 1 minutes. I have to wait for 13 minutes. After deleting your tweet, it adds deleted tweets in Efemr archive that can be found in the dashboard. In the archive, you will found a Retweet link. Clicking on this link will post the tweet again with same expiry tag hashtag. So, the new tweet will again be deleted after the specified time span. Use this nice tool and play with your tweets. Efemr is a nice tool if you do not want to keep your tweets for a longer time. But the added time span hashtag may confuse your followers. Still, it is worth to use. Use Efemr and share your views with us via comments.